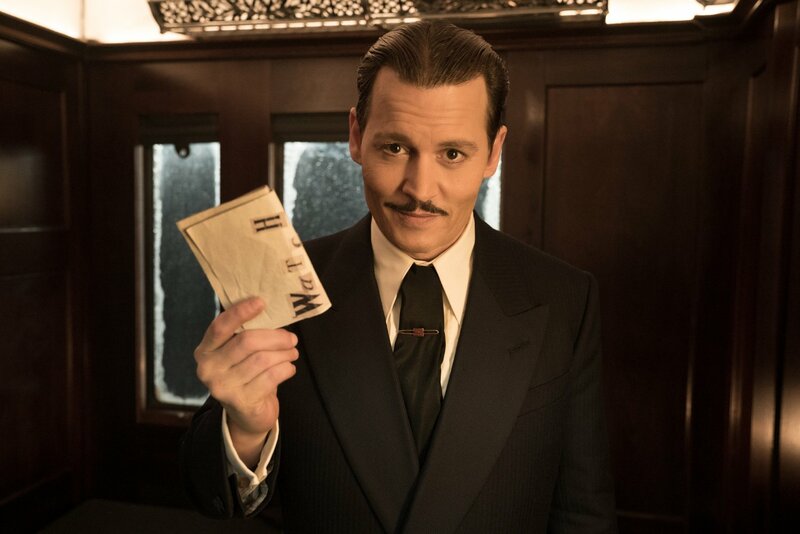 A star-studded 2017 remake of Sidney Lumet’s star-studded 1974 film, “Murder on the Orient Express” is the second big-screen retelling of Agatha Christie’s 1934 whodunit yarn on a locomotive. Once again, it is lavishly mounted and bursting with a cavalcade of first-class acting talent, but this rendering is a surprisingly flat mixed bag. It’s only intermittently diverting, poky when it should be enthralling and suspenseful, and never as involving as it wants to be. 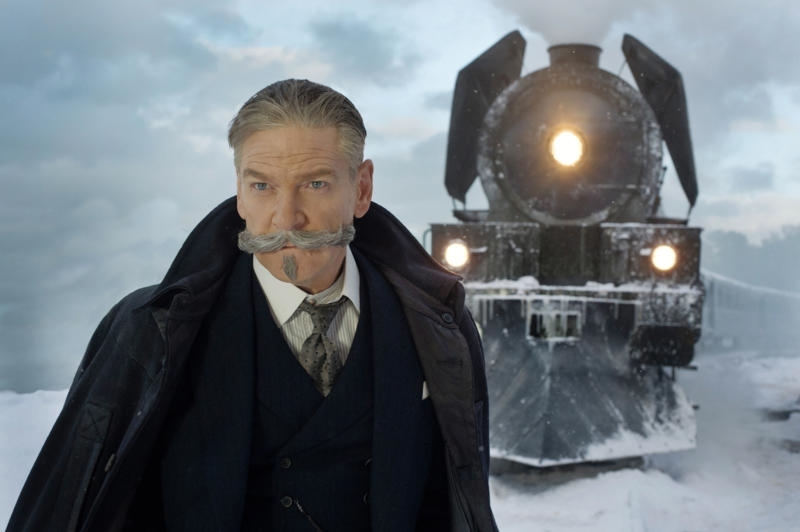 While most of the film’s $55 million budget went to paying a troupe of stars as part of an ensemble piece, director Kenneth Branagh (2015's "Cinderella") comes off self-congratulatory by casting himself (and his glorious mustache) front and center in every frame like a one-man show instead of devoting much time to the other passengers. Having positioned itself as the award season’s kick-off for a starry, refreshingly old-fashioned entertainment and a whodunit mystery that is usually reserved for BBC and PBS, “Murder on the Orient Express” is a crashing disappointment with the biggest mystery being how it could waste so many untapped performers. The great Belgian detective Hercule Poirot (Kenneth Branagh) has just cracked a case of a stolen artifact in 1934, Istanbul. When he runs into a scoundrel of a friend, Bouc (Tom Bateman), Poirot is offered a place on a sleeper train en route to Calais, France. Hopping on board the Orient Express, the detective hopes for a vacation, until an avalanche stalls the train. Then a dead body turns up in one of the cabins, having been stabbed repeatedly in the chest, and one of the passengers on the train is a murderer. The suspects include governess Mary Debenham (Daisy Ridley); black English physician Dr. Arbuthnot (Leslie Odom Jr.); husband-hunting widow Caroline Hubbard (Michelle Pfeiffer); smarmy art dealer Edward Ratchett (Johnny Depp), butler Edward Masterman (Derek Jacobi) and private secretary Hector MacQueen (Josh Gad); religious maid-turned-missionary Pilar Estravados (Penélope Cruz); Austrian engineering professor Gerhard Hardman (Willem Dafoe); icy Russian Princess Dragomiroff (Judi Dench) and dutiful handmaiden Hildegarde Schmidt (Olivia Colman); dancer Count Rudolph Andrenyi (Sergei Polunin) and his sick, barbiturate-taking wife, Countess Elena Andrenyi (Lucy Boynton); and Cuban businessman Biniamino Marquez (Manuel Garcia-Rulfo). Not everyone is what he or she may seem, and Poirot will not rest, interrogating each and every one of them on their alibis, until he finds the killer among them. 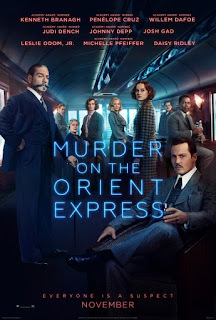 “Murder on the Orient Express” would seem to have all of the proper ingredients for a worthwhile whodunit, including pedigreed source material, a pro at the helm, and a seemingly endless murderer's row of A-listers all in costume and ready to shine. While Hercule Poirot might be one of Agatha Christie’s long-lived characters who appeared in 33 of her novels, he deadens the proceedings almost from the word go. 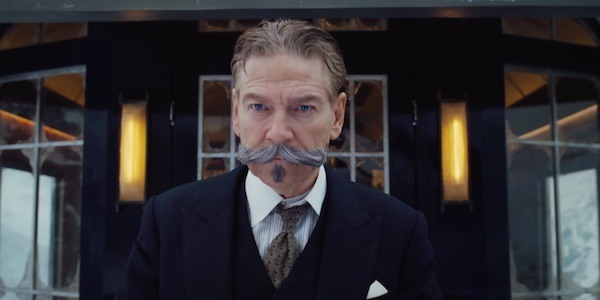 With a hammy, self-amused accent, the preening, mustachioed Kenneth Branagh’s shtick delights at first and then grates on the nerves thereafter. In small doses, his comedy lands, from giggling while reading Charles Dickens to wearing a mustache guard in bed. However, as he opens the film in a lengthy prologue, proving Poirot is “the greatest detective,” and then even gets a backstory involving his lost love, it becomes a long haul with Poirot trying to outshine everyone else. Out of everyone, Poirot gets an arc, but it feels dishonestly earned. At the end of his case-cracking in Istanbul, he expresses his worldview to a policeman, “There is right, there is wrong, and nothing in between.” And yet, by the end of cracking the case on the Orient Express, Poirot takes all of ten minutes to realize that life is more complicated beyond black and white. Screenwriter Michael Green (2017’s “Blade Runner 2049”) had his work cut out for him, adapting Agatha Christie’s oft-adapted yarn as a highbrow potboiler but taking few liberties outside of flirting with a certain passenger of a different race. With an impressively assembled cast at director Branagh’s disposal, it feels like a major missed opportunity when so many of them are underserved, not only for there being so many characters to manage but because director Kenneth Branagh makes himself the star. They are all purposefully underwritten playing strangers who have secrets and then all become murder suspects, each given a single compartment to play in, although only a few get the chance to make a juicy impression or even register. Haters of Johnny Depp will delight in knowing that he ends up being the corpse, and he might have the most lively interaction with Poirot over a pastry before rigor mortis sets in. Enlivening every scene she gets her hands on as Caroline Hubbard, Michelle Pfeiffer is appropriately slinky and gets in a few delicious lines. With her innate charisma, the lovely Daisy Ridley (2015’s "Star Wars: Episode VII - The Force Awakens”) lends enough spark as Mary Debenham for one to wish she had more to do, while Broadway actor Leslie Odom Jr. has the same qualities and gets the same treatment. Josh Gad and Penélope Cruz each have their own respective moments, too, but in other thanklessly tertiary roles, Willem Dafoe is nearly forgotten and Dame Judi Dench gets to give annoyed glances and answer Poirot’s questions. Production values are solidly handsome, with sweeping shots of the train ripping around the track on a snowy mountain, and Alexandra Byrne’s costume design is exquisite. Although on a few occasions, it seems as if even a pro like Branagh and cinematographer Haris Zambarloukos struggle on where to place the camera within the train. For instance, a tracking shot from the exterior of the train isn't even stylishly show-offy as it bungles the introduction of Mrs. Hubbard, roving from window to paneling to window to paneling, and an overhead shot that remains hovering in the corridor when Poirot discovers the dead body in one of the cabins is awkwardly staged, favoring the tops of the actors’ heads. A more fluid camera movement dollies down the aisle of the train, getting a reaction from each passenger. 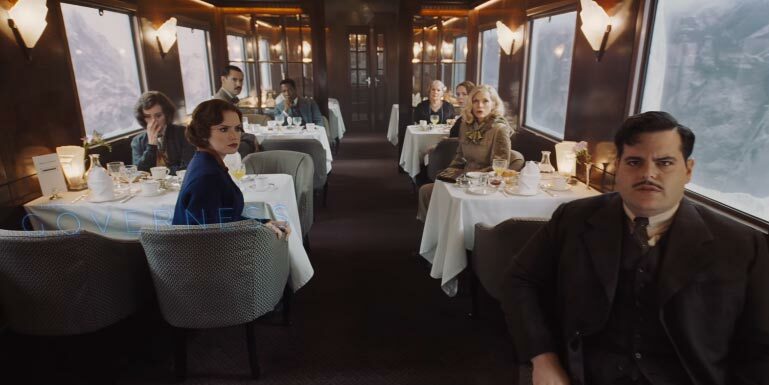 Since the whodunit reveal of “Murder on the Orient Express” is already well-known—and it is a humdinger—it’s a matter of seeing how the filmmakers will get there. As the film chugs along, the mystery lacks urgency, the tension remains slack, and the claustrophobia of being in a train with a murderer among the passengers is never taken full advantage of by Branagh’s stately direction. Poirot takes so many leaps from clue to conclusion with deduction that there’s little time for the viewer to get wrapped up in the mystery. As the motive behind the killer (or killers) clearly tries to move on an emotional level, the only thing the viewer is left to feel is indifference, and that shouldn’t be. All dressed up with little place to go, “Murder on the Orient Express” is just inert.